Jin Hyun-pil (LEE Byung-hun), who operates a massive pyramid scheme with his One Network corporation, is investigated by Financial Crimes Unit’s Captain Kim. Just when Kim thought he had Jin dead to rights, Jin uses his shadowy supporters to stay one step ahead of the investigation. If you are one of the many people who had been on the receiving end of the many MLM’s (multi-level marketing) pitches from “friends” whom you haven’t seen from long time ago, this movie might just reaffirm your suspicion on the evils of this scheme. Featuring CEO Jin Hyun-pil (Byung-hun Lee), the charismatic boss of One Network whose motivational speech strangely resembles that of some pastor. The story was pretty straightforward, the good – anti-corruption investigator Kim Jae Myung (Gang Dong-won), the bad – CEO Jin Hyun-pil (Lee Byung-hun) and the in-between tech expert, Park Jang Goon (Kim Woo-bin) who works for Jin. For those who have been watching Korean films, you will find Kim Woo-bin’s smart yet comedic character similar to his roles in The Con Artists and Twenty where he shift from bad to good. The first part sees Park Jang Goon stuck between his boss and the investigator Kim’s threat to put him in jail if he doesn’t become the informant. It was a fun watch to see him try to get out of the sticky situation, and also escape with a some money. Gang Dong-won is extremely charming in a somewhat Steve Rogers way as investigator Kim Jae Myung. Some might find him boring, but I felt that the impression was created because of the lengthy 5 act-movie, instead of the usual 3 acts. After a pretty exciting but failed plot to capture the MLM CEO who fled with $3 Billion, investigator Kim was demoted while Park went into hiding. The plot undergo a reboot and many scenes were skipped or taken out to shorten the lengthy movie. This made Kim’s maniac character seem dull in comparison to Lee Byung-hun’s mercenary character. The repetitive second search was somehow enhanced by enlarging the project to a greater scale, bringing the fraud case overseas to the slums in Manila. While the director tried his best to keep the momentum going with fun music and on point transition, there were still some moments and characters when I wished they could either remove or develop properly. He did not try to tap on the audience’s compassion with the victims’ plight. Instead, the scenes were detached and disengaged to show viewers the big picture. This is also the first time I truly appreciate Lee Byung-hun’s charisma and charm without his G.I.Joe’s muscles. He could easily turn from a charming CEO to a cold-hearted con-man in a split second, making you love and hate him at the same time. This complex crime thriller provides numerous twists and double-crosses among the characters to keep the audience excited. It is a fun watch and feel-good movie which provides both action and crime investigation twists with pacing slightly better than that of the Hong Kong crime films. The filmmakers prepared for 5 long months in order to find the right locations. Filming of this movie began on 23 April 2016. Filming took around 2 months time in the Philippines, including Binondo, Intramuros, Bulacan, and Cebu with over 200 crew members. Considered as one of 3 worst slums in the world, the shoot took the crew to the alleys of Manila’s Tondo, the Manila Cathedral, and Manila’s largest bridge called Jones Bridge and other locations that depict trademark look for the city. A butcher shop was transformed by the production team into Jin’s hideout and the final showdown consisted of 6 police cruisers and 120 real police officers and security personnel. In addition, 16 police cruisers and 140 officers aided in the chase between Capt. Kim and Jin, and both sides of the Jones Bridge was blocked off for the shoot. It was first time ever for a Korean film to shut down and shoot on this bridge. This is the first time Lee Byung-hun return as a villain, 8 long years after playing his last antagonist role in THE GOOD, THE BAD, THE WEIRD. 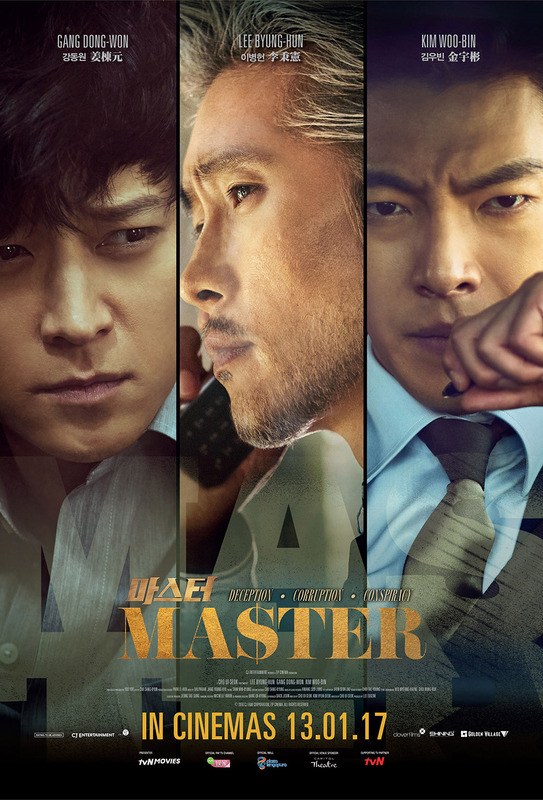 MASTER Korean Movie (마스터 | 偷天对决) is distributed by Clover Films and Golden Village Pictures in Singapore. MASTER Korean Movie (마스터 | 偷天对决) is out in cinemas on 13 January 2017. *Disclosure: Invitation from Clover Films Singapore and GV Pictures. No monetary compensation was received for the movie review. This looks like action-packed movie! I like to watch this type…Korean heros generally look very stylish and handsome so one more reason to watch.. I didn’t know they shot here in the Philippines, lol. I laughed on how you describe the CEO’s motivational speech and that it resembles of a pastor’s speech. Which is true! lol I *HAD a friend who’s into MLM and I avoid her like a plague now. OMG I’m a super big fan of Kim Woo Bin. I like him to the moon and back (well together with Lee Min Ho). so I will watch this movie. Wow. This was shot in the Philippines? They should show this in cinemas here. I know friends who are into K-Drama and K-Pop. They will watch this movie! Reminds you of a pastor’s speech? That’s funny! I’m a fan of crime action thrillers! Have watched all those cbi fbi series… So I might like this! Because this was shot in Manila, and I am familiar with Tondo, Manila Cathedral and Jones Bridge, I should watch this film. They have been showing Korean films in Manila lately so hopefully they show this one too. I recently just watched a Japanese gangster film set in Manila too.